The Roland RE-201 Space Echo was hardly the first tape loop-based delay device, but added sophisticated controls—such as variable tape speeds, three-input mixer, 12 mode settings, and a built-in spring reverb—that took it beyond the competition. [The] Space Echo offered a certain sound that soon became a favorite of artists of the time, including Bob Marley, David Bowie, and Pink Floyd, and remains a staple in live performance and recorded tracks today, whether from vintage originals or in plug-in form. First introduced in 1973, the Space Echo series of products are considered to be among the finest tape-based delay units ever created, and are still sought after today. Though there were a number of different models through the years, the RE-201 Space Echo—first launched in 1974—was both the enduring benchmark and most popular. With its three separate playback heads, built-in spring reverb, and distinctive 12-position Mode Selector, the RE-201 was easy to use and capable of a wide range of creative, organic echo effects. As such, it found a home in many different music applications, from recording sessions to concert performances. The Space Echo was also an important component in the reggae-driven dub sounds created by early electronic music artists. BOSS RE-20 Roland Space Echo pedal. 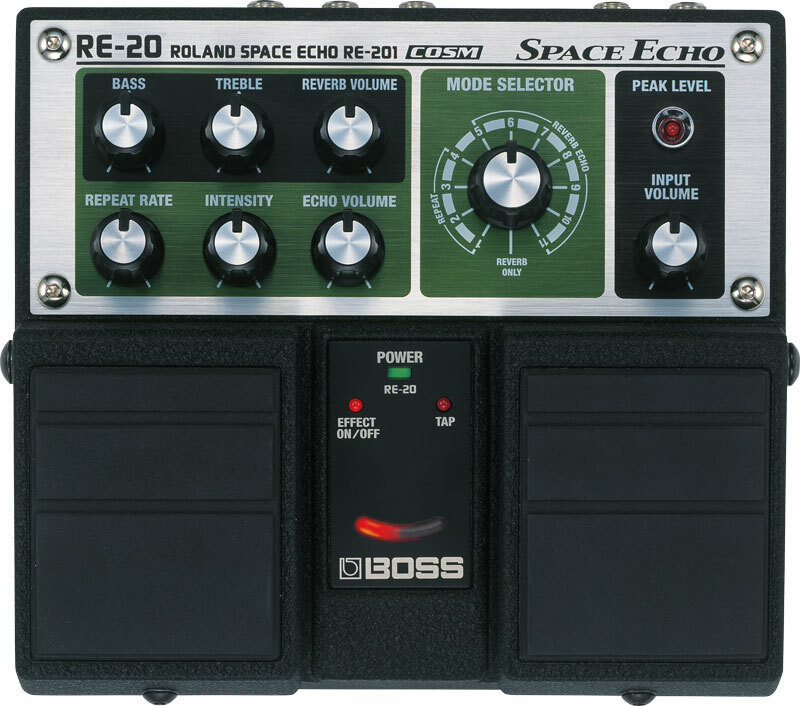 Today, you can experience the mojo of the RE-201 with the BOSS RE-20 Space Echo pedal. Housed in the popular Twin Pedal format, the RE-20 employs BOSS’ COSM technology to fully capture the classic Space Echo vibe in every way. All of the original’s controls are faithfully replicated, and adjusting them in real time produces identical behaviors as well. The RE-20 offers a few modern conveniences too, including stereo operation, tap tempo, and more. Read more about the RE-201 and RE-20 at BOSS Users Group.